International marketing is a strategic decision that involves developing a marketing mix strategy based on the characteristics of a potential foreign market. In simpler terms, it is how organizations should design and convey their messages if they want to sell their goods and services in a foreign market. Cultural differences make this process more complicated and should therefore be the starting point of preparing a strategy. Cultural differences in marketing form the fundamentals of the international marketing mix. 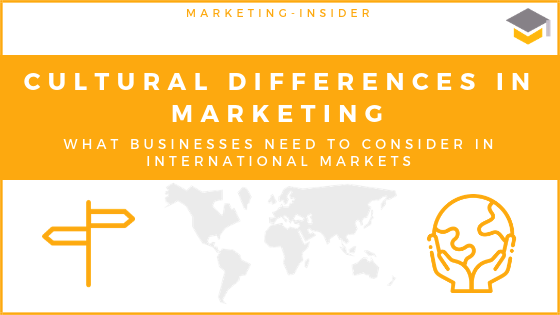 Cultural differences in marketing should receive primary attention when selling goods or services internationally, as the cultural environment changes one country to the other. This means that multinational companies must understand the culture of a specific state before selling the products. Here are some significant cultural factors that businesses intending to move to the international stage should consider. Languages are some of the major cultural differences in marketing that companies ought to understand before they market their products and services in a foreign country. Previously, grave mistakes have occurred during translation, which has led to devastating effects. One of the most memorable embarrassing mistakes in international marketing happened when General Motors was marketing its cars by the brand name ‘Nova,’ which in South American local languages, translated to, ‘it won’t go.’ These mistakes obviously don’t help the company to sell its products. Therefore, companies need to pay attention to language and translations to avoid business failure. In as much as pricing strategies appears to be economic factors, they are important cultural differences in marketing. It is common knowledge that some cultures have a higher purchasing power than others. For example, people in the United States have a higher purchasing power than those in Africa. This plays a significant role in how you should price your products and services. In addition, it should be taken into consideration that some people have high purchasing power, but tend to hold money rather than spend. Therefore, you have to come up with a strategic marketing plan that will make people exercise their high purchasing capability. As a marketer, you are already aware that personalities and cultures combine to shape the consumption behavior of individuals in a particular country or region. Before marketing your products, you need to determine whether individuals in a specific country make individualistic or collective buying decisions. This will help you to formulate a marketing approach that appeals to personality or a strategy that pulls the entire society. You’re also required to understand the psychological and societal factors influencing buying decisions. Just like in domestic marketing, age and other demographics significantly contribute to cultural differences in marketing. For example, in developing countries, literacy levels among senior citizens, especially those above 60 years is very low. Therefore, you may decide to target your marketing message not directly at this demographic group, especially when selling digital devices. Moreover, you’ve to understand the dominant demographic groups in a country before you can modify your marketing messages. This will help your country to appeal and communicate to the majority rather than the minority. Eating habits are further important cultural differences in marketing that multinational companies need to understand. For a food selling company, it is essential to understand the eating habits of a particular region before marketing its menu. For instance, McDonald’s and other fast-food companies had to start offering vegetable products in India rather than meat products. Likewise, these companies have started to increasingly cater to international tastes, like rice dishes for the Asian market. Religious beliefs are important cultural differences in marketing that should be considered when selling in foreign markets. They influence how a particular society perceives various products and services. Organizations have to understand the impact of religion and its role in society. For example, in Muslim countries, marketing secular women outfits might be off as the religion in these countries requires women to dress in a modest way, which is highly regulated. Besides, some marketing messages have been at loggerheads with religious groupings after their messages were deemed to be offensive towards a particular religion. Religion is a very critical aspect that companies need to understand before they can start marketing their products at the international stage. Most of the cultural differences in marketing are restrictive. However, companies should make sure that they fully understand all the cultural factors before they can formulate and roll-out their marketing strategies. Extensive research would help an international company to understand what is good and bad in different countries and regions. Most of the companies that have excelled at the international stage have done so by identifying a product or a service that will be accepted in a particular region.